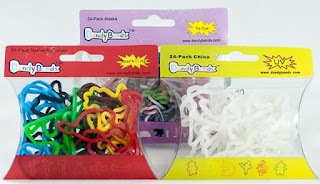 As low as $2 for 120 Dandy Bands (Silly Bandz) Great for Easter Baskets! Free Shipping! Head over to Groupalicious and you can score 120 Dandy Bands for as low as $2 plus get free shipping! The deal is on sale for $7, but new Groupalicious shoppers get a $5 credit when they sign up, making it only $2. You'll get 5 packs of 24 Dandy Bands. A great idea would be to open them up and fill Easter eggs up with them. They would make great eggs to hunt for!